I believe I have control of my computer again...after many hours of discussion with India, South Korea and the Philippines. I have today successfully moved from Vista to Windows 7 and I now feel like that small Asian kid on the Windows commercial just smiling and looking dreamily happy in front of her computer. I even put a flower as my background on the desktop. Needless to say, there has been little weaving here while in Vista la la land along with a bad back. But things are now improving. Here's a photo of my continuing search for a line of scarves I would like to create...my Bug Scarves is what I call them. I have yet to find the right combination of yarn, sett, hand and time to weave. Here's a link to one of my samples. It wasn't quite right...nor was the one after. 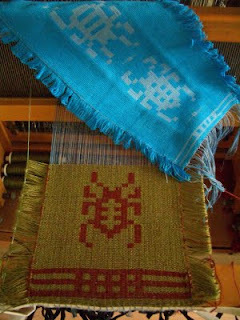 The blue combination in the photo consisted of sewing thread warp with a 60/2 silk weft. The pattern and sett were nice. No separations. But not exactly the hand I wanted plus it took way too long to weave; 8 round trip passes to complete a square. I am patient but not that much. I had patience enough to complete only three small beetles. No way could I complete a scarf. I could make the beetles smaller but I like the size relative to the negative space. The olive green and cranberry experiment currently on the loom has the same sewing thread warp but a bamboo weft. It feels fairly nice but one never knows until after you wash it. This is the same yarn I used in my woven mystery story. I should have a lot of bamboo yarn left after I finish some extra material for the sleeves. This will be a laid back experiment, no rush to finish. But even now, I am not sure I have enough patience to finish a scarf. Time will tell.